This is another photo from Road Trip '05. The longtime home of the NHL's Toronto Maple Leafs, Maple Leaf Gardens is a storied arena full of hockey lore. 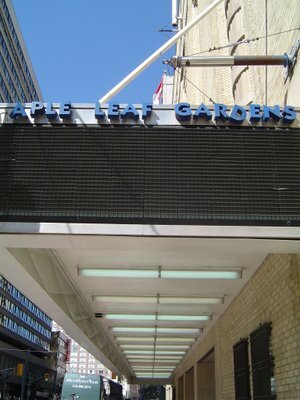 Unfortunately, since the Maple Leafs moved in with the NBA's Toronto Raptors in the Air Canada Center across town, the Maple Leaf Gardens have been largely ignored. To wit, notice the marquee lists the building as the "Aple Leaf Gardens". Add that to the homeless sleeping in recesses along the exterior of the building, and, well, its not a pretty site. When this photo was taken, work had just begun on the Gardens in an effort to reshape it into an urban market / bazaar to be anchored by a grocery store.